Our favorite movies filmed at Caesars Palace. Director/Choreographer Frank Gatson Jr. injects new life into Jubilee! The Wolfpack runs wild (again) in The Hangover Part III. 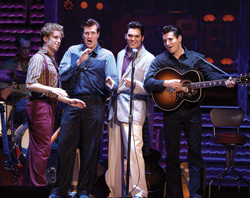 Tony® Award-winning musical shines its spotlight on the greatest impromptu jam session in rock ’n’ roll history. Twenty years monkeying around in Vegas. Surf the Musical, featuring music by The Beach Boys, hangs ten at Planet Hollywood. Next Pussycat Dolls: purr-fectly cast.